When viewing a record, you can view related activity in the right-hand panel. The first thing you will see are Linked Records, but below that, you will see icons for Activities, Tasks, Events, and Files. Clicking each of these icons will bring up the respective items as they relate to that particular record. This Activity Stream within the action panel functions exactly the same as the main activity stream within Zengine. The only difference is that the activity that is visible is specific to the record that you are on, and it is filtered to show the most recent 100 activities. 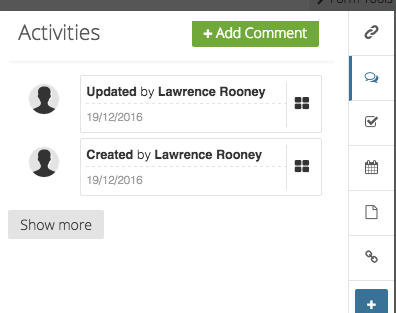 Changes to the record, comments, tasks, events, and files will all show up on this activity stream. If you want to add a comment, click on the green "+Add Comment" button. From here you can type in your comment, @mention (called an "at-mention") any workspace member to notify them, and even attach files. Once you click save, your comment will be listed on the activity stream for this record. The Tasks panel shows up to 100 tasks related to the record, along with whether it is open or completed, the due date, and who it is assigned to. From here you can add a task, or click on one to edit it. 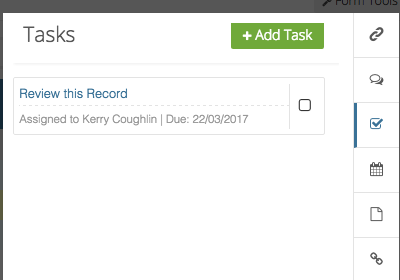 You can name your task, leave comments, assign your task to a workspace member, set a due date, select a priority and more. Whenever you assign a task to someone else in your workspace, they will receive a notification. Once you have completed filling out the task click save and it will be viewable on both the activity and task portion of the action panel, as well as on the main tasks tab. The Events panel shows up to 100 events related to the record. 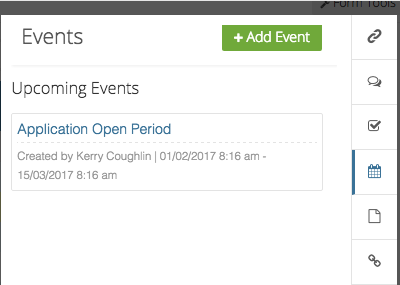 From here you can add a related event, or click on one to edit it. From here you can name your event, leave comments, set a start date and select an end date. Once you have completed filling out the event click save and it will be viewable on both the activity and events portion of the action panel, as well as on the main calendar. 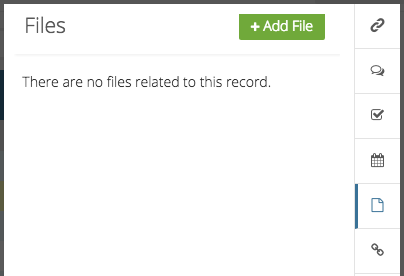 The Files panel shows up to 100 files related to the record. Just as with the other tabs, you can add and view related files.